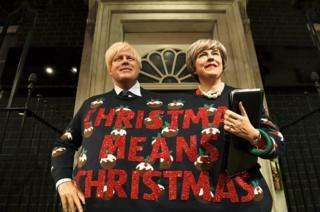 Image caption To celebrate Christmas Jumper Day, waxworks of Britain's Prime Minister Theresa May and Foreign Secretary Boris Johnson wear one Brexit-themed Christmas sweater between them at Madame Tussauds in London. 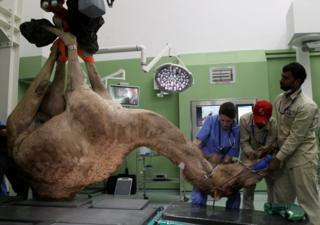 Image caption A camel is brought in for foot surgery at the Dubai Camel Hospital in Dubai, UAE. The hospital opened in 1990 and is equipped with X-ray and ultrasound equipment, as well as operating tables. 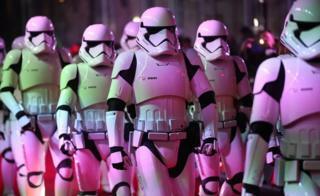 Image caption Actors dressed as stormtroopers arrive for the European film premiere of Star Wars: The Last Jedi, at the Royal Albert Hall in central London. 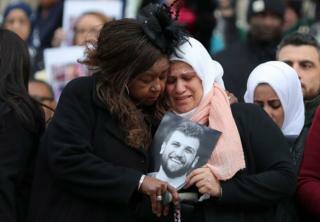 Image caption Mourners leave the Grenfell Tower national memorial service at St Paul's Cathedral, London. The multi-faith ceremony was held to mark the six-month anniversary of the tower block fire that killed 71 people. 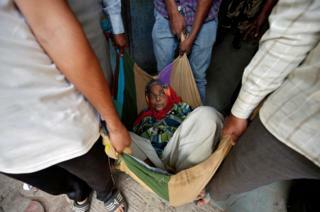 Image caption An elderly woman is carried in a blanket after casting her vote at a polling station during the last phase of Gujarat state assembly election in Ahmedabad, India. 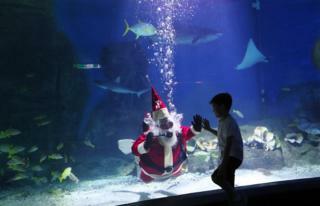 Image caption A person dressed as Father Christmas swims among the sharks and stingrays at an aquarium in Melbourne, Australia. Image caption Rogelio gives Miriam her wedding ring as they get married through the border wall between Mexico and the United States. On International Human Rights Day, families separated by the border are reunited for three minutes through the fence that separates Ciudad Juarez Park in Mexico and Sunland Park in New Mexico, United States. 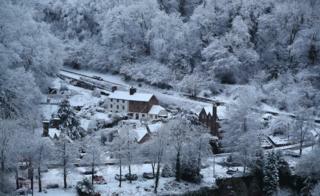 Image caption Parts of Britain woke up to a blanket of snow over the weekend, as seen here in the Shropshire village of Ironbridge. 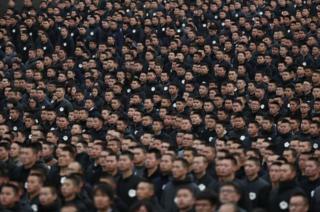 Image caption Chinese people attend a memorial ceremony commemorating Nanjing massacre victims in Jiangsu province. 13 December was the 80th anniversary of the massacre by Japanese troops where China says more than 300,000 of its people were killed. 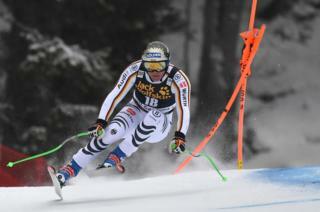 Image caption Thomas Dressen from Germany competes for the Alpine World Cup in Val Gardena in the Italian Alps. 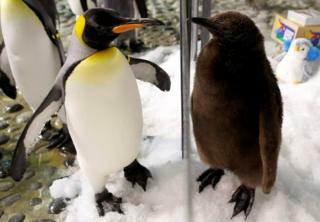 Image caption Maru, a two-month-old king penguin chick, looks at an adult penguin at the Jurong Bird Park in Singapore. Maru is the first successful hatching at the park in almost a decade. 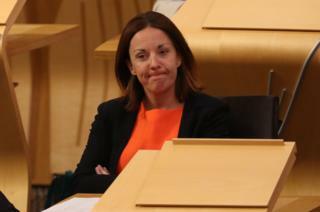 Image caption MSP Kezia Dugdale sits in the main chamber of Scottish Parliament after returning from Australia where she appeared on I'm A Celebrity... Get Me Out Of Here! Although she received a warning for her appearance, she escaped suspension by party bosses.